I've talked a lot this month about groups, how they are formed, and how they influence us. But a big part of social psychology, especially it's current cognitive focus, is on attitudes, and how they influence us. And as good social psychologists, we recognize the formation and influence of attitudes is determined by others and our perceptions of what they expect from us. Attitudes are tricky, though. They alone do not shape what we do. In fact, there is a great deal of research on how attitudes are a poor predictor of behavior, known sometimes as the attitude-behavior gap or value-action gap. There are other factors that influence us, that may interact with or even counteract our attitudes. Instead, various forces including attitudes shape what is known as behavioral intention - what we intend to do in certain situations. This intention is then used to predict the behavior itself, recognizing that situational forces may exert their influence between intention and behavior. Not long after publishing on this model, Ajzen decided to build on this theory to improve its predictive power. Thus, the Theory of Planned Behavior was born. This new theory adds one additional component to the old theory: perceived behavioral control. This concept was influenced by self-efficacy theory, and represents a person's confidence in his/her ability to engage in the behavior in question. 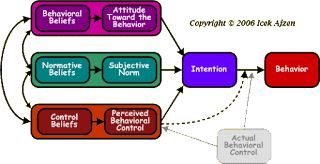 Perceived behavioral control is influenced by control beliefs, or beliefs about the factors that may help or hinder carrying out the behavior. Each of these three factors not only influences behavioral intention, they can also influence each other. For instance, your own attitude about something can color your judgment of what others think. The degree of control you believe you have over the behavior can influence your attitude. And so on. Because psychologists recognize that perception can be biased, he also included a box for "actual behavioral control." What we think may not be accurate, and what is actually true may still influence us, even if we fail to notice the truth. Humans are skilled at self-deception. One important thing to keep in mind if you're trying to predict behavior from attitudes is that specific attitudes are more predictive than general attitudes. Asking someone their general attitude toward the legal system will be far less predictive of how they vote as a juror than their attitude about a specific case. But even when you measure a specific attitude, you may not get the behavior you expect. For my dissertation research, I studied pretrial publicity - information seen in the media before a case goes to trial - and its influence on verdicts. Pretrial publicity is an interesting area of research, especially because no one has really found a good theory to explain it. That is, we know it biases people, but when we try to apply a theory to it, the study still finds pretrial publicity effects but often fails to confirm the theory. I decided to apply attitudes to the study - very specific attitudes. That is, I hypothesized that pretrial publicity information is only biasing if a person has a specific attitude about that piece of information as indicative of guilt. So, to put it more simply with one of the pieces of information I used in my study: finding out a person confessed is only biasing if you believe that only guilty people confess. I gave participants news stories with one of four pieces of information: confession, resisting arrest, prior record, or no biasing information (control condition). Then I told them they would be reading a case and rendering a verdict, but first, I asked them to complete a measure of attitudes. These measures are sometimes used during a process known as voir dire, in which potential jurors are questioned to determine if they should be added to the jury. Embedded in this measure were questions about the specific pieces of information. They read the case, and selected a verdict. The problem is that, like so many other studies before, I found pretrial publicity effects, but attitudes were often unrelated. Even people who didn't believe confession was indicative of guilt were more likely to select guilty when they heard that information pretrial. I was able to apply some different theories to the results, ones related to thought suppression and psychological reactance, concepts I've blogged about before. But I was quite disappointed that I still couldn't fully explain what I was seeing. Like I said, attitudes are tricky. just popping by on te AtoZ challenge, bit to deep for me in here I'm afraid!